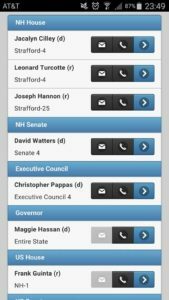 GenCourtMobile is an exciting new tool designed for New Hampshire liberty activists. It’s a mobile app that makes it easier to keep track of legislation, committee hearings, and legislator details on your phone. When logged in, and viewing a bill, you can subscribe to receive automatic notifications – when anything about the bill changes, an email will be sent to you. From ‘Bills’ / ‘My Subscribed Bills’, you can view the bills you are tracking, along with their latest status. Tap ‘Maintenance’, then ‘View Recent Changes’. This will display bill status updates, committee membership, legislator info / status, etc. When you specify your town (and ward, if applicable) in your account profile, it allows you to gain quick access to all of your reps, senators, executive councilor, and the governor through a single page. You can use that to call and / or email them from one place! There’s also a link to their respective profile pages – useful for keeping track of what your state rep(s) and senator are up to! This page is under ‘Legislators’ / ‘My Legislators’. GCM was developed to help New Hampshire liberty activists, and as such, access to certain feaures is granted only to those who are truly working toward the goal of maximum individual liberty, and minimum government involvement. How can you prove that you are a liberty activist? By supporting the NHLA, of course! If you are a current Full or Lifetime NHLA member, you can request full access to GCM by emailing membership@nhliberty.org. If your membership has lapsed, please renew! An invitation email will be sent to you, containing instructions on how to create your GenCourtMobile account. (Note that this login will be separate from your NHLA login.) To help verify who you are, please use the same email address used for your account on the NHLA site, if possible. Many thanks to NHLA Lifetime member Seamus Casey for making this unique tool available to NHLA members!